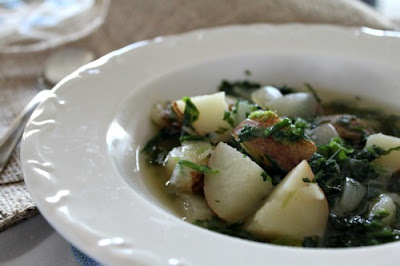 This Soup is another family favorite. I have no idea where the recipe originated. 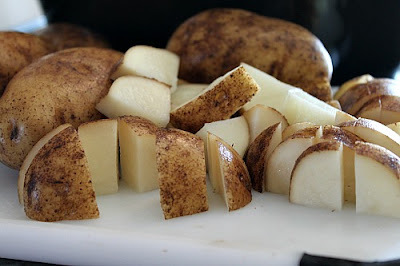 It is one of those that my mom made all the time, and that I now have memorized. I am so excited to share it with you. 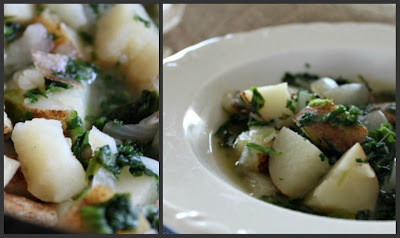 It is amazingly delicious and super healthy to boot! 1. 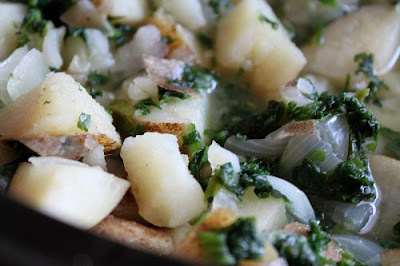 Clean and cut 8 medium potatoes and one large onion. 3. 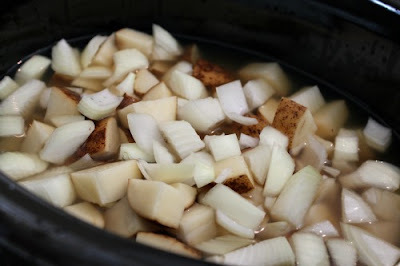 Put potatoes and onions in a crock pot. 2. 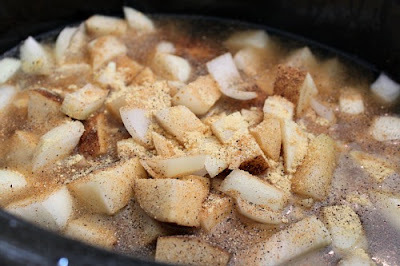 Pour about 6 cups or 48 oz of chicken broth on top of the potatoes and onions. 4. Sprinkle about a tsp. 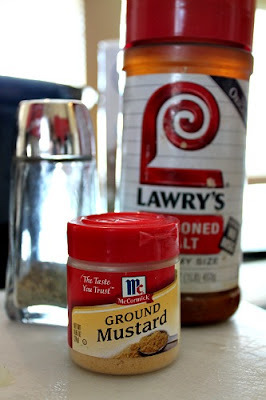 of dry mustard, 1/4 tsp of season salt and as much black pepper as you like to the above mixture. I just eyeball it. 5. 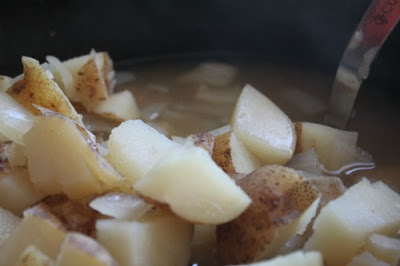 Cook on low for 6-8 hours or until the potatoes are nice and tender. 6. 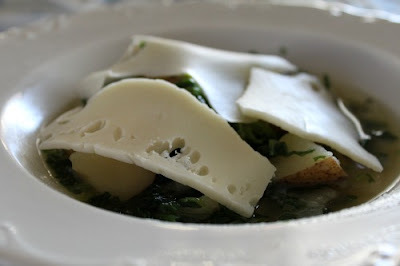 An hour or so before serving, add one package of frozen spinach to the soup. 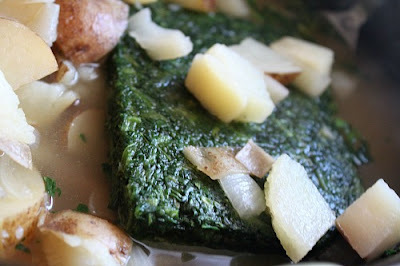 Let simmer until the spinach is thawed and well blended. I always like to make homemade whole wheat breadsticks to serve along side this yummy dish. 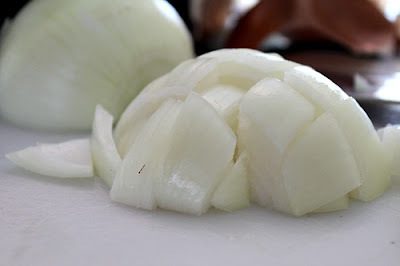 I will have to post that recipe some time soon! I made this and it was awesome! I did change a few things to suite my needs- I cooked it on medium on the stove top, used fresh chopped spinach, and added lightly sauteed shitake mushrooms. Thanks for the inspiration! !